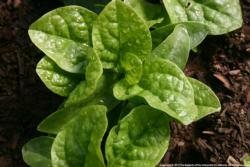 Harvest spinach as soon as the leaves are large enough to use. You can pick individual outer leaves, or carefully cut the entire plant above the growing point to encourage a second harvest. Once the plants mature, it is best to harvest the whole plant rather than just the outer leaves. To ensure a continuous harvest of tender young leaves, plant in succession every week or two to extend your harvest window. Oriental Giant, Hybrid Giant arrowhead-shaped leaves are sweet and crisp, on long stems held high off the ground. Vigorous plants will produce all winter long. 18–24" tall. Plant 8–10" apart. Regiment, Hybrid Tender deep green leaves with sweet, nutty flavor, on high-yielding plants. 10–12" tall. Plant 6–8" apart.